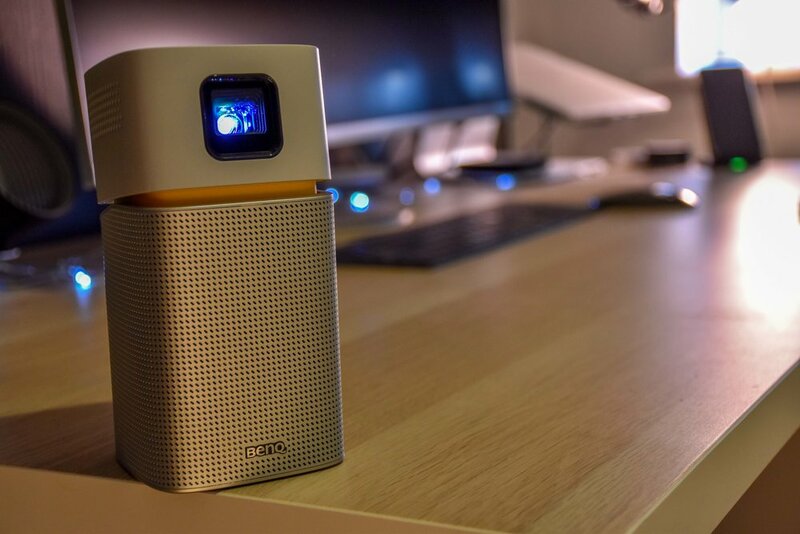 Standing just 15.5cm high the BenQ GV1 is an incredibly smart looking portable wireless projector. Due to be released soon the GV1 will offer a perfect mobile projection solution with built in wireless casting and airplay for iOS. For presentations hook up your laptop and you’ll be amazed at the quality this little device delivers. Text is crisp and images are surprisingly bright and colour reproduction surprisingly good. There are some things we would like to see improved in software and or future updates, i’ll come on to those. Check out the video below for the full review or scroll down for tech specs and pro’s and con’s. This device is not designed, I believe, to replace or be a home cinema projector. It fits much better as an occasional or back up projector but more likely a travel projection system. With a perfectly adequate output, great sound delivered by the 5 Watt speaker and a 3 Hour battery will mean that this can easily be used for Outdoor garden cinema, Meeting and Presentations or ideal as a kids / bedroom projector. We would really love to see some changes both in software and hardware in future releases / updates. Add the ability to install Apps via the BenQ Android interface - Netflix and Prime Video etc. Increase the resolution to 720p or ideally 1080p, this would make the project a really serious device and home cinema alternative. We love the Bluetooth Speaker feature where you can turn of the projector and connect to the speaker and therefore have a great mobile speaker delivering a punchy sound. Despite the low resolution, for the purposes discussed, we were very happy with the output. *The model we tested was a pre production unit and therefore may be subject to some changes before final release. for more information check the manufacturers website here. *LED lamp life results will vary depending on environmental conditions and usage. Actual product's features and specifications are subject to change without notice.